The Shabby Stamper: Dusty Durango, Crushed Curry and Soft Suede! Can I just say one more time how much I love the new In Colors?? 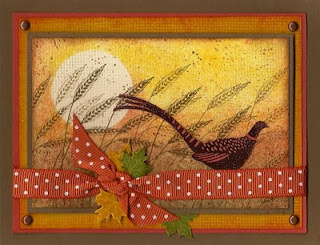 This was a really quick card, just to try out an idea that I had with Autumn Days, one of the new pre-order sets. The little cut-out leaves were a total after thought, but I like them. I layered Soft Suede, Dusty Durango and Crushed Curry. The Crushed Curry layer is stamped with Canvas in CC and the edges are sponged in Dusty Durango. I masked the sun onto the central image, then sponged Crushed Curry, Dusty Durango and Soft Suede. The wheat is stamped in on-and-off Soft Suede. It is all overstamped with Canvas in Sahara Sand and the spatter from Itty Bitty Backgrounds in Close to Cocoa. The pheasant was stamped in Chocolate Chip craft ink on Dusty Durango cs and clear embossed. Awesome!! What a beautiful card. You do totally amazing work and thank you for giving us a sample so quickly. Am I jealous, YES!!! Wow, amazing card. Loving the new colours too. I wasn't sure I should have ordered this set, so glad I did now. I am sooooo jealous! This is one of the most beautiful cards I have seen in a long time. The color scheme, the layering of stamping, the use of the stamps together...so very beautiful! I saw this card last nite on your gallery for SCS and thought about it all nite. That sounds silly but I had no intention of purchasing that set and you totally changed my mind Thanks! Gorgeous work! This is just so beautiful. I love the new In Colors even more after seeing them on your cards. Wonderful! I'm digging this stamp set and the new colors are yummy. Firstly I have to say that I am totaly jealous that you already have your caty and new goodies! Up here in Canada it often takes about 10 business days to get things so, fingers crossed, my stuff will arrive later this week! Your card is just gorgeous! I didn't think I liked this set at all, but since seeing this on SCS I am percolating with ideas for it! TFS!! This card is gorgeous...love the shading!